This entry was posted on October 27, 2015 by Theresa Frassrand. November, the month of Souls in Purgatory, is dedicated to all the souls who have died, but have not yet been admitted into Heaven. 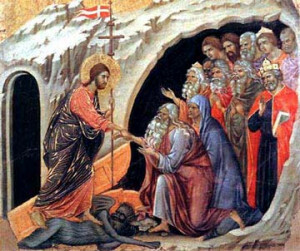 Jesus' Incarnation, Death, and Resurrection, allowed for admittance into Heaven, but because of "free will" every person can chose whether they want to be with God. Every moment in life is the opportunity to say yes or no to this. When someone dies, Jesus looks at his/her life and sees how much they loved Him. If they didn't love Him, He lets them continue in that choice and allows them to go to Hell. If they loved Him perfectly, He allows them to abide in Heaven. If they loved Him, but imperfectly, in His Mercy He allows them to enter Purgatory where the imperfect love is made perfect through purging. Purgatory is a tempory state and will pass away. It is a place of Mercy.